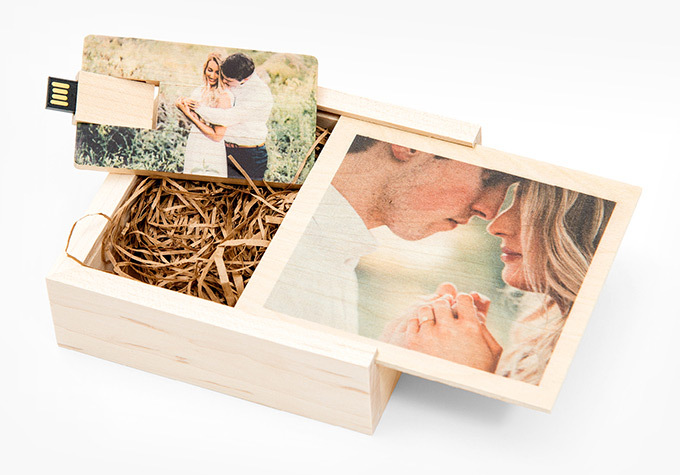 These 5x5" solid maple wood boxes can be personalized with your logo, a photograph, or graphic design. Rustic shredded kraft paper filler is included in every Wood USB Box. USB Boxes are not color corrected, nor is white ink used in the printing process. The natural wood grain will replace any light-colored (highlight) areas of any image being used. USB Boxes are available to order with Custom USBs or separately. Interior Dimensions of the box is 4 3/16" x 4 3/16" x 1 2/16". Box size is compatible with all three custom USBs: Premium Acrylic, Premium Wood, and Standard White.